The 2018 Audi A4 continues to impress with an expanded standard-equipment roster, more high-tech features and competitive pricing. More models receive standard quattro all-wheel drive this year, and Audi makes some of its optional driver-assist features standard on the Premium Plus and Prestige trims. How I want to die in an Audi. It is a really great car. I feel like such a cool dude riding in it. I am rich and this car shows what a joke I am as a capitalist casualty. I suggest that if you want everyone to think your a total American capitalist, get this car. Nothing makes up for a small package (you know what I mean) like a cool car. All the girls will drool over you while you drive this. My quest for money makes me want to end my life everyday. I hope everyday that I get in a crash with this car and I can end it all. So take my advice and get this car! Cheers!! Audi a4: perfection within four doors. 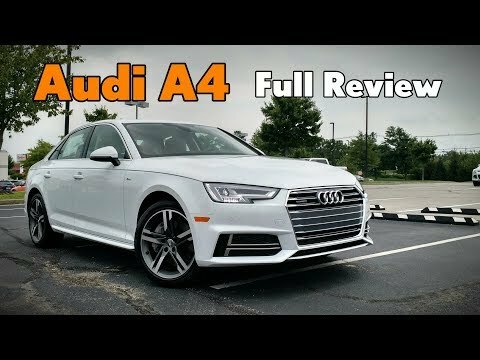 The 2018 Audi a4 is truly a premium vehicle having all the bells and whistles anyone could ask for in a luxury vehicle. The drive is fantastic. Whether you are sitting in driver, passenger or backseat, the comfort is perfection feeling the smooth performance the entire trip! From the heavenly sound system to many hands-free tools, the Audi a4 is the perfect vehicle for anyone. Sport and luxury, the car handles well yet the interior is fancy. Sport and luxury in one car. Quick, not to mention easy on gas. Plenty of room and very up to date technology. Heated and cooled front seats with 3 zone temperature control so all passengers can ride comfortably. I have only had the car for 2 months and have not experienced any reliability issues but expect maintenance to be more expensive than usual.